ideally suited for two people. The hide a bed mattress pulls out on floor, ideal for young children. island explorer bus service that is run for Acadia National Park. along the shore path which starts at the pier. See activities below for a fuller description. In the Bar Harbor Historic district. The commercial district is a few blocks away as is the town pier. We had a great stay. 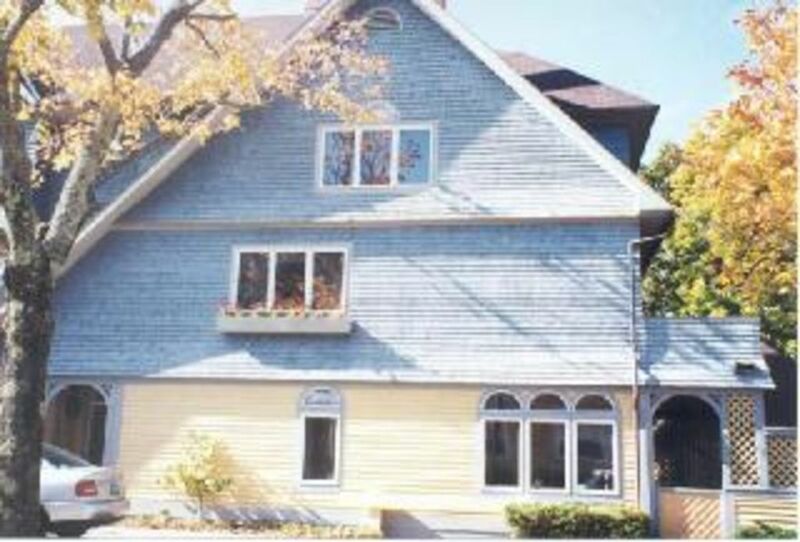 The condo is located perfectly in Bar Harbor making walking anywhere in town possible in minutes. It was clean and equipped with just about everything you would need at home. We would definitely recommend stay here. Great location! Perfect for a couple. This rental was perfect for my husband and I. It was nicer than the pictures gave credit for. This rental is in a great location in town, has a fully stocked kitchen, comfortable bed, cozy fireplace and amazing shower (great water pressure and very hot). We also really liked having the outside patio. The only thing we did not enjoy was the couch. It needs to be replaced (we had to prop pillows under the cushions to keep from sliding off of it). Regardless, we adapted and still very much enjoyed everything else about this rental. The couch in question has already been replaced with a new one. We pay attention to these comments. The place delivered on why I selected it as far as its location; 4 blocks to a super market, 2 blocks to a convenience store, 3 blocks to the buses that take you into the park with the town and harbor right behind that (can easily walk throughout the whole town from the condo), and easy access right up the road into the park if you drive yourself. My unit in particular had a great little enclosed (covered but open air) porch that was a really nice bonus. The place itself was efficient (very small pantry so don’t bring too many non-perishables – go to the super market and stock the fridge!) and had everything I needed but comfort. Two lightly padded chairs in the den area were OK for rigid sitting but to try to relax, there was one couch that was so used/cushions ‘smushed’ that it felt like you were being pushed off of the couch – very hard to find a comfortable spot. Aside from that, this place delivers in terms of its location and access to the town and park. GPS tip (Garmen): punching in 49 Desert Rd. took me to that address but it was a different 49 Desert Rd. about 20 miles past Bar Harbor proper. When I punched in the adjacent road (Roberts Ave.), my GPS took me right there. Convenient to town and Acadia National Park! This condo was perfect for a couple! We loved the location, keyless entry, quiet street, and parking. The only recommendation would be a more comfortable couch in the living area! We would come back to this location and recommend it highly! Very neat and clean. More amenities than I realized. My wife loved it and we really enjoyed our week and all that was in the area. Great to be able to walk into town. The kitchen was well stocked ! We enjoyed the side deck and the easy walk to town! stunning vistas of mountains, rocky seacoasts, and numerous islands. activity. A unique carriage path system is ideal for walking and biking. The fall foliage in October is spectacular. are available. Boats can be rented for sailing and fishing. A golf course is available in Bar Harbor. specialty, and many unique shops and galleries. 2019 Rates Early Season: May 5 - June 22 $775 High Season: June 23 - July 31 $925 Late Season: Sept 1 - Sept 28 $825 Fall season: Sept 29 - Oct 31 $775 Rentals are Saturday to Saturday, 5 days minimum, 6 in high season. Inquire for off season long term rates. Fully refundable deposit required. State sales tax added.